Neither did I grow upon R.D.Burman’s music nor have I heard his complete repertoire of film soundtracks. Spending your childhood in a small Town in Tamilnadu means no exposure to anything related to the language Hindi. But later I realized that, even with such little exposure, those very few Hindi songs that invariably made its way into such Hindi-phobic little towns were that of R.D.Burman. When people used to praise A.R.Rahman as next R.D.Burman, I use to wonder why. Now, after watching the documentary ‘Pancham Unmixed’, I am convinced. What intrigued me even more was the information about R.D.Burman’s approach to film background scores. 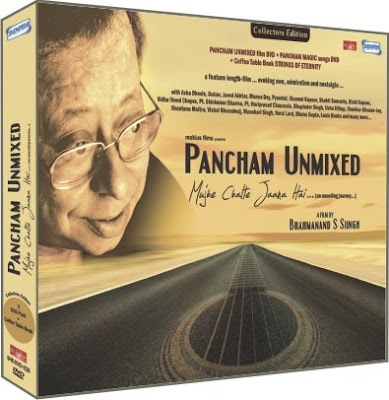 Today being 16th death anniversary of R.D.Burman, I decided to announce a contest, the (one) winner of which, will be awarded a DVD set of the Documentary ‘Pancham Unmixed’ from yours truly. Send a detailed analysis or review of your favorite film background score, in no less than 1000 words, to backgroundscore@gmail.com on or before 31, January 2010. The film chosen can be from any Indian Language or English. The article sent for the contest should not have appeared in any other online forums or blogs or websites before. Based on the number of entries, the date of announcement of the winner will be decided and communicated later. Please spread the word about the contest.